Your group's most important tool for being successful and sought after in the workplace. Here is how to avoid being engulfed by the turmoil. We will explore and explain what went wrong in our society, then give you a simple three step process to remedy it in your own career, business, family and friendships. Equally important is how to think about these rules — how to use them as tools to handle situations we run into each day at work, school, at home and in the rest of our lives. In other words, schools are peer pressure cookers, and our daily lives are filled with people who were raised not by adults but by their peers. The Ethics Solutions course of instruction helps you cope with these people and, we hope, enlighten those who are most important to you. 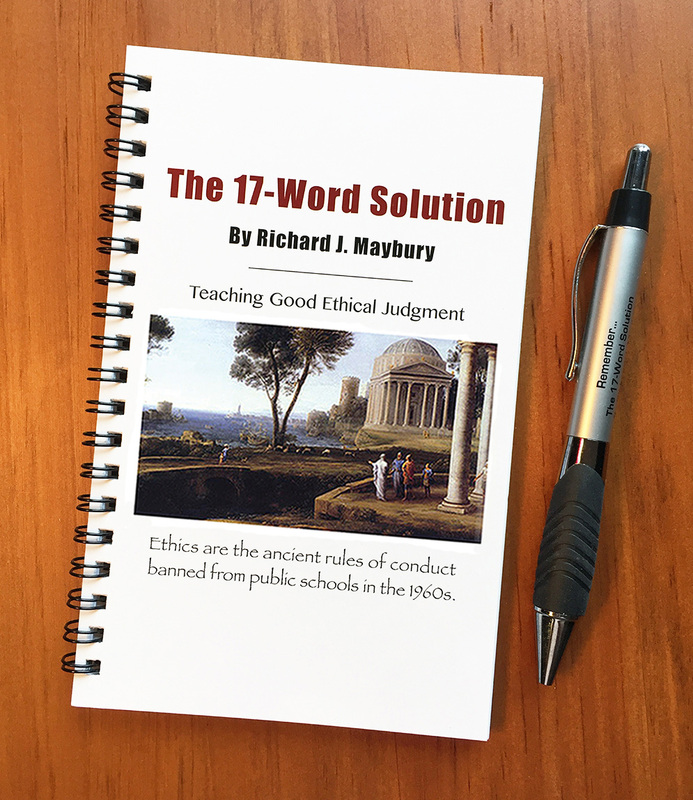 Ethics Solutions has condensed the six years of ethics instruction into a single small, easy-reading booklet called The 17-Word Solution.™ This handbook is the first step toward solving your ethics problems; every member should read it. It takes only about two hours. 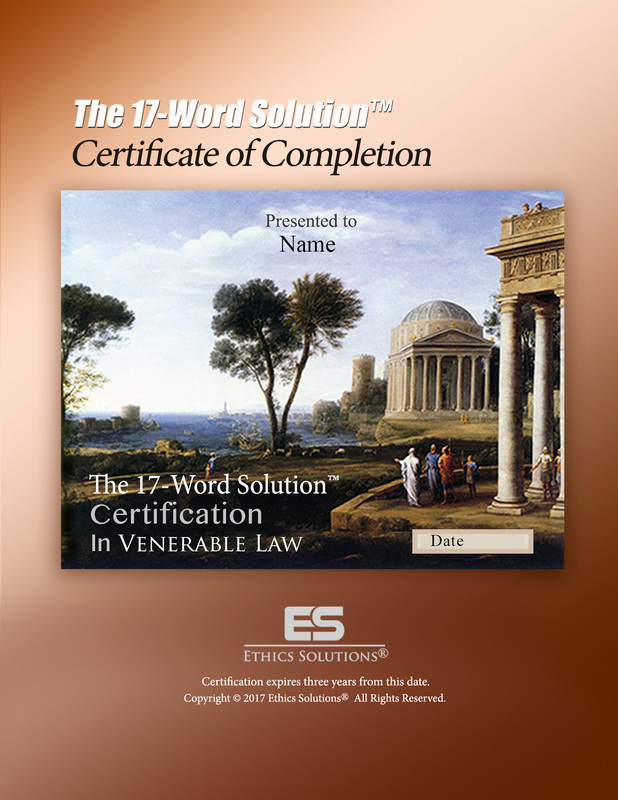 Step two: The Ethics Solutions® Assessment helps you evaluate how well you absorbed The 17-Word Solution.™ It usually takes less than 30 minutes and is given online. And please think about this: if you do not help the people in your life learn ethics, who will? If the need for teaching ethics to is so obvious, why aren't schools already doing it? We suspect because schools are still afraid that teaching ethics automatically means teaching religion, and they will get in trouble with government regulators. Another is to show the person the bad things likely to happen to him or her when a rule is broken, and the good likely when it is obeyed. The 17-Word Solution™ takes this pragmatic approach. After a member of your group has read the handbook, . . . The assessment is instantly scored, and the results are reported to the individual and the group leader. If the individual has demonstrated proficiency, a Certificate of Completion is immediately issued to him or her. This handsome, impressive, full-color certificate gives an individual a sense of pride and confidence so that, in the face of troublesome peer pressure, he will stand his ground and do the right thing. If the individual did not achieve proficiency, at the leader's discretion, he or she can review the handbook and take the assessment again. It only takes one unethical person in a sensitive position to wreck an organization. But an organization that has a reputation for always behaving ethically is golden.